Share a sweet surprise with someone you love. Luxurious lodging, champagne and dinner. Treat your significant other (and yourself) to a memorable, romantic getaway with our New England Inn & Lodge Romance Package. We'll help you both feel like you're someone special, letting you tell that special someone, "I love you" in the most wonderful way. 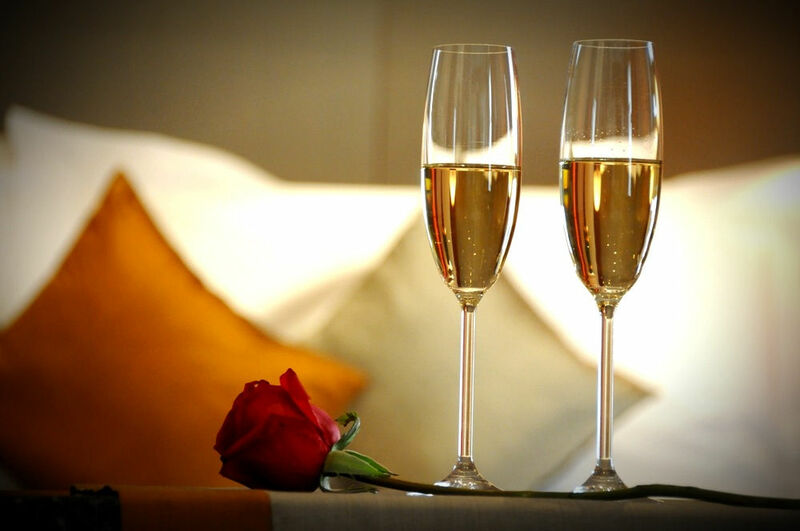 Kick back and relax in your luxurious, adult only accommodation and toast the weekend with a glass of champagne. Enjoy the scenery, go shopping (tax free of course), enjoy one of the many area attractions or reconnect in the private, intimacy of your room, suite, cottage or cabin. Enjoy a continental breakfast each day and a delicious dinner for two, one evening at Tuckerman's Restaurant & Tavern, just a short walk from your lodging. To check rates and availability for the north country romantic package enter your dates and from the rate drop down menu select "North Woods Romantic Package" or for personal assistance call us at 603-356-5541 or 1-800-826-3466. Cannot be combined with any other Discounts, Specials or Promotions. Subject to NH 9% room tax. *All entrees are on the regular menu, 22 ounce prime rib subject to an extra charge. ** Champagne substitutions allowed, with 48 hour notice.